General and Sarah Winston are each 83 years old and have been married for 57 of those years. As General suffered a stroke in recent years and Sarah’s arthritis worsened to the point of having to use a wheelchair, their beautiful home in West Point, Georgia, began to suffer, as well. 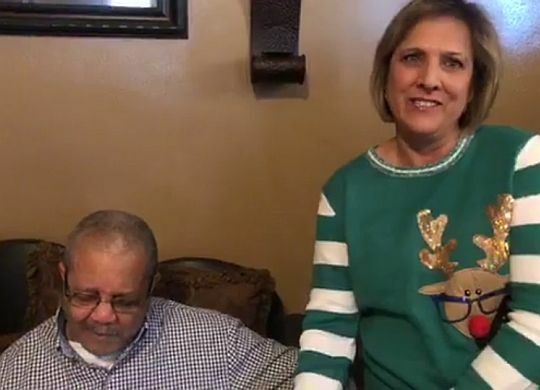 In fact, their struggles to maintain their home got them down so far that they decided it was not worth even putting up a Christmas tree this year — until a few kindhearted local folks stepped in, that is. West Point Mayor Steve Tramell heard about their plight and enlisted the help of the Chattahoochee Fuller Center Project and others in the community to make badly needed repairs. Meanwhile, CFCP leaders Kim Roberts and Robin Pierre made sure the Winstons had a Christmas tree, as well. “This is what Christmas is all about,” Roberts said, her eyes welling up as tears streamed down the face of General Winston.